One of the most important pieces of baseball equipment that can go unnoticed are cleats. Having the right cleats can improve your running ability and can positively affect your leg muscles which can be especially important in growing youth. In this article we will cover several different brands of cleats and what the pros and cons of each of those are. Whether you’re buying baseball cleats for your own children or you are buying a gift for someone, there are a few factors to keep in mind. You want to make sure the cleats are comfortable so that the child who uses them will be able to be their best on the diamond. 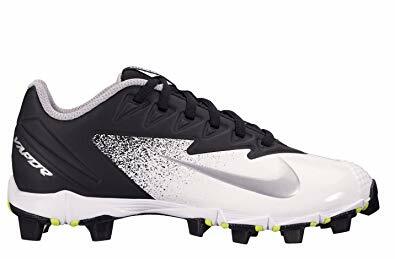 Double check before purchasing if you need to get a pair for a wider set foot and always make sure that the cleat bottoms are made of rubber for the most safety. The Adidas Icon Mid K are pretty new, being released for the 2018 baseball season. They are known for packing in stability, style and comfort all for a relatively decent price. These cleats are available in black/red, black/royal, plain black and onix with plenty of sizing options. They feature a nubuck which is cowhide leather that has a feel similar to suede which makes the shoes more durable and support the user better. They feature an outsole made from molded rubber which makes for better traction, screen printed material to enforce damage protection and a midsole of ¾ length for extra comfortable cushion. These are not full high-tops so they may lack ankle support for some. If you’re looking for comfort and/or stability, these may be the cleats for you.The toe area has perforations to help with breathability. These also include a nubuck leather upper which again, not only is soft but is also durable. The tongue, insole and collar are all padded for extra comfort. They only come in black and have a low-cut design to them. 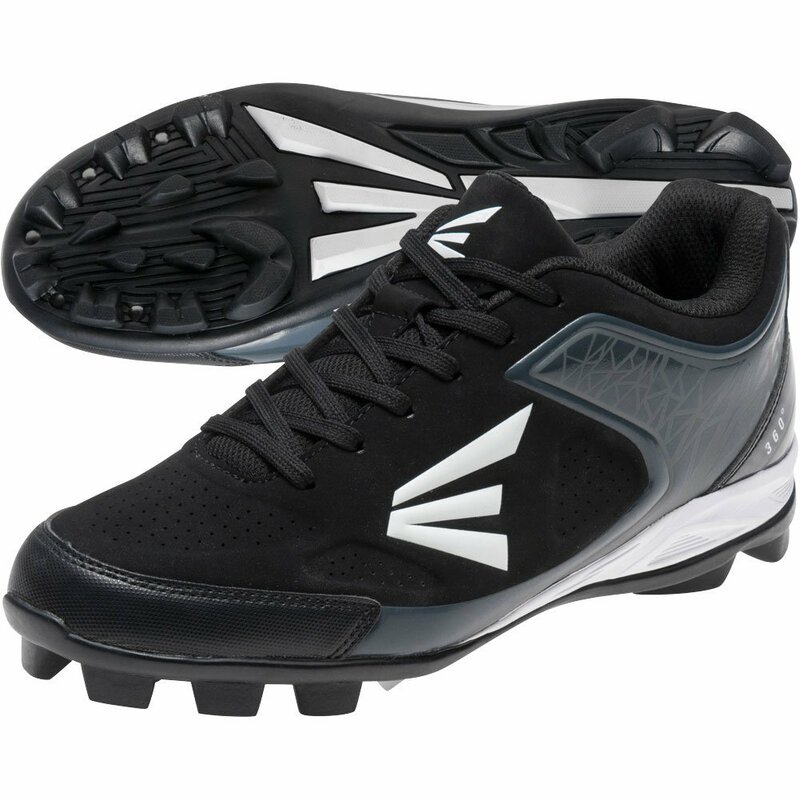 The Easton 360 Youth Baseball Cleats are available in sizes 1 through 6 with half sizes included. Another feature is the EVA foam midsole that provides cushion, a double density rubber outer and a specific patented configuration that provides great traction. Equipped with rubber studs on the bottom make these safe for youth and are good for leagues that don’t allow metal spikes, as well as having a grip that works great on dirt and grass surfaces. 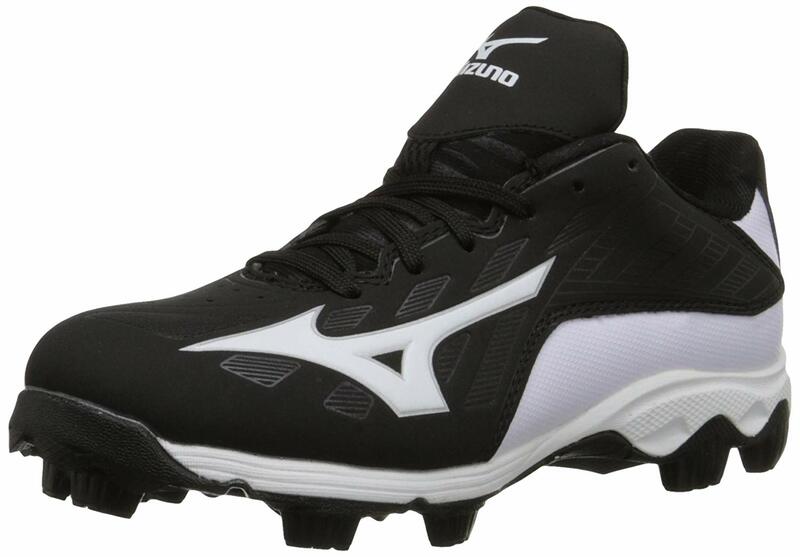 You will find the Mizuno logo on the sides of the shoe and the tongue if that’s something that would apply to whether or not you consider a cleat or not. Under Armour Harper RM Jr.
Named after a baseball star, Under Armour Harper RM Jr. are not only stylish but incredibly functional as well. They are designed specifically to give amazing traction, increase your speed and help with mobility while on the field. These are available in 5 colors including the follower: black on black, black with metallic gold, black and red, black with team royal and finally, white with metallic silver. The upper is molded synthetic and has an adjustable strap to give a little extra support, stability all while keeping the wearer comfortable. These also carry a coveted full-length EVA midsole while having rubber molded cleats on the bottom. They are available in sizes 1-6 and include half sizes if needed. These cleats use a technology called Vectan filaments throughout key parts of the upper of the cleat. They are to shoes as cables are to suspension bridges. They are known for having a great fit while still being lightweight. The midsole is made out of phylon with provides cushioning to the bottom of your foot. Nike uses flex grooves on the outsoles to help with range of motion for the wearer and helps to keep that consistent. 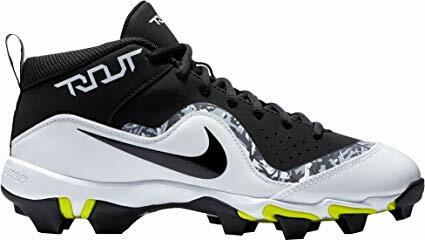 The bottom of the Nike Boys’ Vapor Ultrafly Keystone BG Baseball cleats have 12 cleats that will give amazing traction during games whether you’re on grass or dirt. You might see the brand Nike and expect to spend a lot but with this specific style, you won’t find that. Unfortunately there are only 2 colors to choose from which can be a deciding factor for some children who will be wearing them. Inspired by Mike Trout who is an outfielder for the Angels and holds an American League MVP title two times. You will find his name along the ankle of this lightweight cleat. You will find a foam collar around the ankle of these cleats giving you extra cushioning, stability and protection from sprains. The upper is synthetic which provides more comfort and breathability for youth. 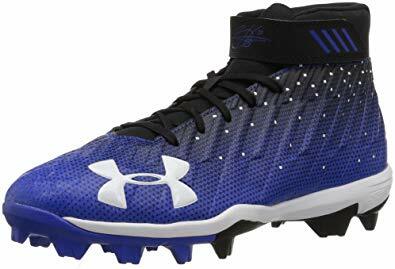 These cleats come in 3 colors including: black and white, game royal and white and white on black. They include a small pull tab near the heel that makes them easy to take off and put on for kids. If you’re looking for even more cushioning, the midsole is made of phylon. These Nikes are available in sizes 1-6 and come in half sizes. 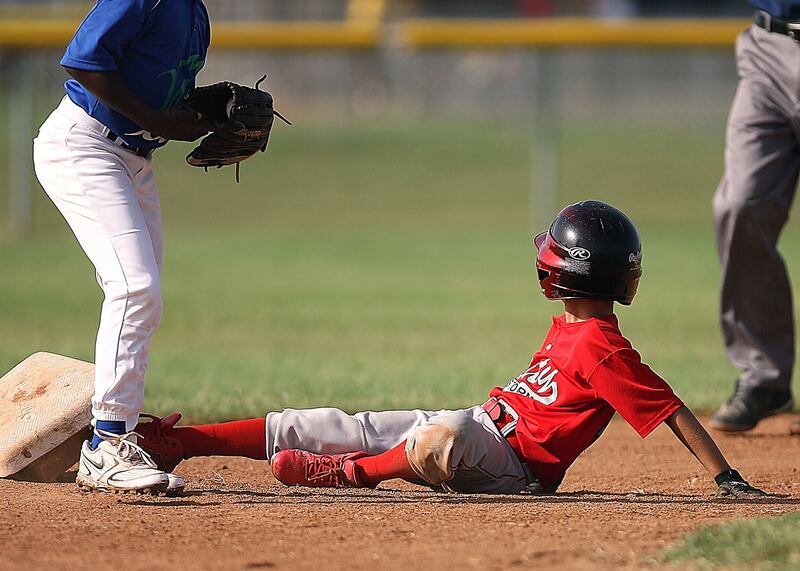 We hope throughout this article you found some of the best youth baseball cleats in 2019 that will work for your child or a loved one you’re purchasing for. There are several different options available if you’re trying to save money or if you have a bigger budget. Making sure there is proper support and that they are comfortable will make game days much better.